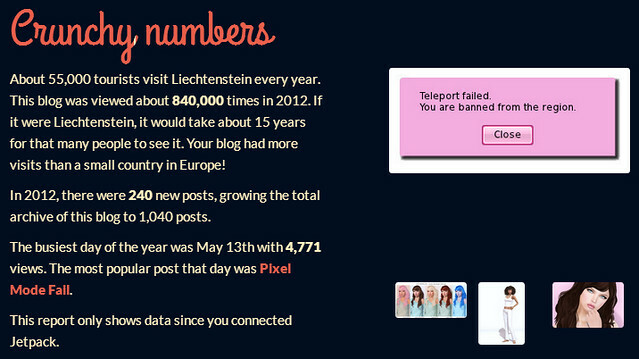 Check out the JuicyBomb 2012 Annual Report to view my stats! Over 840,000 hits in 2012! I’m so excited about this report, thank you JetPack and WordPress! This year’s report is even better than last year’s report! The numbers of hits fell from 1.1 million to 840,000 thousand, but reader interaction went up, cos you guys commented a lot more! The top 5 commenters are: Opal Rae, Anahata, Charlotte Caxton, Vianne, and Tracy Redangel. Thank you so much for your support in 2012! Even though readers do not always agree with me, I have really enjoyed reading your comments, and will try to make this blog even better next year. Ha! Who would have guessed I would be a top commenter, lol. I enjoy your blog because it introduces me to aspects of Second Life I may have otherwise missed out on. You are an inspiration to me and I love your style. I really do love your blog, like I’ve always said your avi is the most beautiful I’ve seen and since I use your shapes it’s good to see what you’re wearing so I know what works for me too! Truly amazing, and something of which you should be extremely proud. Even though I don’t always agree with your opinions, they are always a breath of fresh air. Congratulations! Do you like comments on your posts? Yes! I love comments <3 Blogging is like talking to myself, if nobody responds! 🙂 Thank you for making it less awkward hahaha!